Classes: OMG if you have ever wanted to ask that How-To Video a question here is your chance. There were classes for everything: Beauty & Fashion, DIY & Crafts, Lifestyle & Learning, Food Arts, Home & Home Décor, Quilting & Sewing, Party Planning, Photography and Health & Fitness. I ended up in the “How to Decorate your Christmas Tree” class. Christmas is one of my favorite holidays to decorate for and I had been looking for what my tree needs to make it perfect. I have a 10-foot tree so I this class made me realize I’m not using big enough ribbon (I really should use 4”), I need bigger ornaments (don’t be afraid of those 10” balls) and how to secure the ornaments without making your tree look ‘droopy’. Class Kits: Not every class has a kit, but some do. Totally worth it if it’s a topic your interested in. I sat in and watched a leather stamping class that looked amazing! And then you have all the supplies to go home and try it yourself. Register Early: When you purchase your ticket to the Pinner’s Conference you can also Pre-register for classes. While no class is ever “sold out” because the do hold room for day of walk up attendees its always best to register early so you don’t have to wait in line. The Expo Hall: It’s like walking through all your Pinterest Boards at the same time. There are booths with cocktails, Chalk Paint Stencils and How-to lessons, Party Foods, DYI Supplies for any craft and most of the Class Instructors seem to have a booth so you could go and talk to them after. Note to self, come with a budget – there are tons of items available for purchase! Attire: Wear something that makes you feel creative, so you can feel totally in your element. However, make sure this signature outfit comes with comfy shoes because that Expo Hall is BIG! 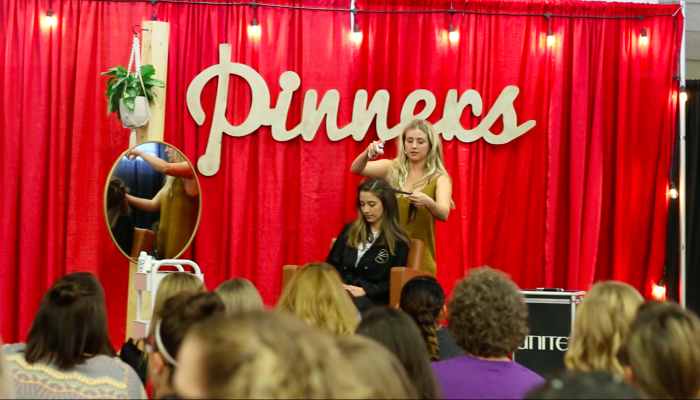 Hope to see you next year at Texas Pinners Conference! Kayla Gostnell is an health nut and workout junkie that never met a cupcake she didn't like. When she isn’t watching the Texas Tech Red Raiders with her husband and 2 dogs, Kayla is enjoying romantic comedies, testing new Pinterest ideas and loading her online Pottery Barn shopping cart with things she’ll never buy. Her future plans include becoming President & CEO of The Container Store in her spare time.